Visitors are all welcome to the Burren National Park. It is a place of tranquillity and quiet. There are five marked walking trails in the Park that take you through many different fascinating and beautiful habitats, such as species-rich limestone grasslands, hazel/ash woodlands and limestone pavements. The Burren National Park is 15 km2 (1500 hectares) in size and is located in the south-eastern corner of the Burren upland region which extends over 360 km2. It was established in 1991 and is Ireland’s fifth and smallest National Park. The Park lands are owned by the State and managed by the National Parks and Wildlife Service. The National Park is divided into eight areas. The main body of the Park lies within the townlands of Glenquin, Gortlecka, Knockaunroe, Cooloorta and Creehaun to the north-east of the villages of Corofin and Killinaboy. The Burren National Park is situated on the south-eastern side of the Burren, in north Co. Clare. 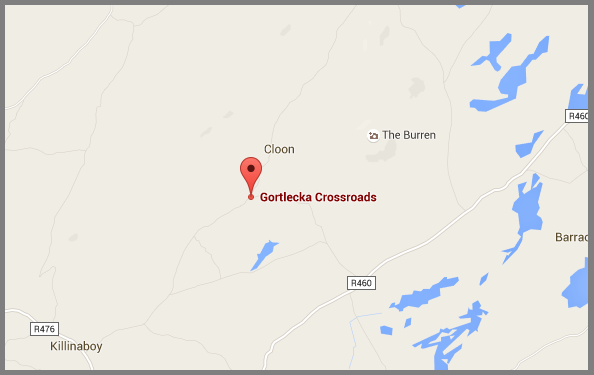 To access the Park, from Corofin, take the R476 to Killinaboy. In Killinaboy take the first right turn (L1112) before the ruins of the sixteenth century church. Approximately 5 km along this road you will reach a crossroads. There is a lay-by just before this crossroads (Gortlecka Crossroads) on the right – please park here. This is a public road so be careful of traffic. The trailhead for the Burren National Park is located at this point. An information panel shows the five way-marked walking trails. Alternatively from the 7th of May until end of August 2018, visitors can avail of the free Burren National Park Bus Service. For more details please go to our Free Bus Service page. Please Note: Parking is limited to lay-bys and roadside. As there is no designated car park there are no signs to direct visitors to the National Park. Groups travelling by coach are strongly advised to contact us before departure. All roads leading to the National Park are narrow and unsuitable for 50-seater coaches. For directions to the Burren National Park Information Point in Corofin please go to our Information Point page. Do not knock any walls, they are there for a purpose and were built hundreds of years ago by the local community. Do not disturb the rock or move it from one place to another, this can be extremely damaging to micro-habitats, and to the structure of the pavement as these rocks provide shelter for plants, animals and soil. Do not chase or scare any wild animals, this includes the insect life, some may bite but most are harmless. Do not pick the flowers or damage the trees, leave them for others to see and wildlife to use. Leave fossils where they lie, they are part of the heritage of the area. Do not park on the road verge or the limestone pavement, these areas often support rare plants. Take your litter home with you and if you see any litter on the ground please feel free to remove it also. Keep dogs under control at all times, they can disturb stock and wildlife as well as other visitors. For more information on Leave No Trace Click Here [Leave No Trace Ireland]. The terrain is very rocky with deep fissures and cracks, there are also loose rocks and steep cliff areas. Please stay on the way-marked walking trails and keep well away from any cliffs and steep rocky areas, as they may be dangerous. The limestone can get very slippery when wet so extreme caution must be taken. Strong walking boots are essential and a map and compass are recommended. The weather is very changeable so waterproof clothing should also be carried. Inform someone of your planned journey and when you are due back. In the event of an emergency dial 112 or 999 and ask for the necessary service. Stay on the trail. In addition to causing erosion and damage to fragile habitats, going off trails increases the potential for injury or becoming lost. Be prepared for all weather conditions and check the forecast before heading out. Bring appropriate clothing, hiking boots and water proof gear. Bring proper equipment, map, compass, first aid kit and fully charged mobile phone. Carry enough water and food for your walk. Lyme disease, or ‘Borreliosis‘, is a bacterial infection passed to humans through a tick bite. For more information on the disease and how to avoid and treat tick bites click on the following link: Ticks & Lyme Disease. These restrictions have been implemented with reference to national legislation and guidance issued by the Irish Aviation Authority and the Data Protection Commissioner.